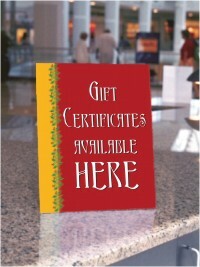 Counter Cards are full color prints on thick 100# cover stock with fold-out easel back. Perfect for counters, customer service centers, cash wraps and check-out displays. Printed with full bleed except our 8.5"x11" Economy Counter Cards will have a 1/4" white margin on all four sides. Choose our Laminated Counter Cards for additional durability in areas like food courts. We will take your copy and create a custom layout on this design for you - we can even include your logo. Add this design/product combination to your cart now and begin the customization process. Standard Production Time: 1-2 business days after art approval.